The Frostwolf Clan stands for glory, honor, and swoll ‘ceps. There is no honor in skipping leg day. Generally, an Orc works out without wearing a shirt, but you’re no Orc. You’re a human and an Orc sympathizer. You love Orcs like Medivh loved whoever Garona’s mother was. (Do I have to say “spoiler alert” if I don’t actually know this to be a true plot point? That’s my theory, though, and I’m sticking to it.) 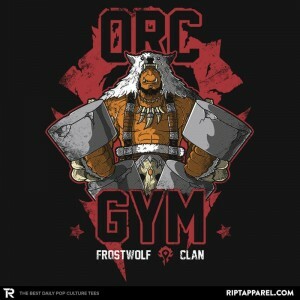 If you want to attract Orcs, you have to work out like an Orc, so wrap this shirt around your torso to exclaim to the world that you’re swoll af FOR THE HORDE. One time, my mom sat me down in front of Star Trek so that the TV could babysit me for a bit and now I have a tattoo of the starfleet insignia on my arm, so thanks, mom! By submitting a comment you grant Preshrunk 🦑 a perpetual license to reproduce your words and name/web site in attribution. Inappropriate and irrelevant comments will be removed at an admin’s discretion. Your email is used for verification purposes only, it will never be shared.